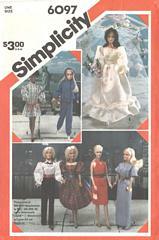 Wardrobe for 11-1/2 inch dolls such as Barbie, Brooke Shields, Mini-Mod and Mademoiselle Eugene. Pattern is uncut and complete and in original folds. Envelope is in very good condition.